A tug of war between the heart and the mind. Intuition, the ability to arrive at an instantaneous understanding without the aid of conscious reasoning is commonly referred to as the sixth sense. For ages, the yogis of the East have worked towards honing the ability to use the power of intuition to reach deep within, where the five senses of sight, touch, taste, hearing, and smell cannot penetrate. This internal subjective ability cannot be easily proven, replicated with a device or for that matter bought and sold. Externally, however, there is a commonplace device which extends the reach of the mind far beyond what the senses are capable of. We call this device the smartphone, which has now become a mass-produced sixth sense. With this device we can scour all the knowledge known to humankind in a matter of seconds, giving us information that the mind would otherwise struggle to find. The relationship with a smartphone is very fulfilling to the mind since there is easy access to variety the mind so desperately craves. Furthermore, the mind does not have to do any of the hard work. Moreover, a smartphone does not talk back, argue and has no expectations of us. This device also collects all of our friends in one handy place through various apps and programs. This increasingly sophisticated window to the world goes wherever we go. Naturally, there is an attachment that grows over time and we are now in an age where we cannot do without a smartphone. While the mind is comforted by the presence of a smartphone, the heart creates a different pull. We all have a deep-seated need for close human relationships which only the heart can fulfill. Conflict ensues whenever the heart and the mind have different cravings. Unlike our relationship with smartphones, which can be transferred to another one at the press of a button, human relationships are more complicated and can be very sticky. Every relationship is unique and is essentially “non-transferable”. Stress frequently bubbles up whenever we try and balance our relationship with humans and smartphones, a tug of war between the heart and the mind. The mind is built by stacking one thought over another. Love cannot be similarly built up because love has a flowing quality and cannot remain stagnant. It is qualitative and not quantitative. The mind, unlike love, grows when thoughts are stored. If it had the flowing quality of love, thoughts and impressions would get washed away. The mind can block the flow of the heart, just as a dam made of rocks can hold up a river’s progress to the sea. But the heart, over time, can wash away even the most bitter and entrenched thoughts just as a flowing river can smooth the rough edges of the hardiest of rocks. 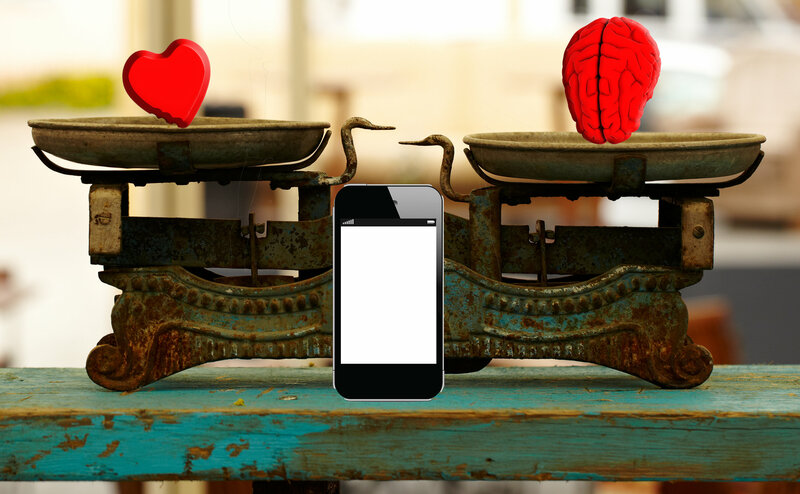 Juggling human relationships with our new found commitment to our smartphones requires balancing the heart and the mind. Logic works in the mind and not the heart. The emotion of love arises in the heart and works through our heart. Emotions other than love may be detrimental to the mind. Smartphones and its various apps evoke emotions in the mind, forgetting that the basis of a smartphone’s functioning is mathematical logic. No matter what the intensity of our emotions may be, a smartphone only responds to cold logic. Human relationships, on the other hand, respond better to emotions. Love adds to a relationship and all other emotions can be toxic to it. When expectations, giving and taking and other transactional qualities enter human relationships we move away from the heart into the framework of logic. Since smartphones feed the mind and human relationships feed the heart, they are mutually exclusive. The mind may be kept aside without disturbing our human qualities. The same cannot be said of the heart. A smartphone is by default an extension of the mind. Weaning away from the mind involves increasing the influence of the qualities of the heart in our lives. Our eyes turn from being consumers of content that shows up on a smartphone’s screen to being tools of expression of what our heart wants to speak. Love flows and human relationships thrive only when there is more giving and less taking. Just as a river needs to continuously flow in order for it to get replenished with fresh water from an upstream source, love cannot remain fresh unless it flows. The more we give, the fresher and stronger will be the stream that flows from the heart. A smartphone cannot replicate that. We don’t need the power of intuition to feel the flow of love in human relationships, even a baby can feel it.